Full disclosure: Although he’s lived in North Carolina for decades, and knows more about the workings of government in the Tar Heel State than just about anybody, Paul O’Connor is a Connecticut Yankee. Bless his heart. Despite that, or perhaps because of it, he approached this book about the causes of the Civil War (aka, in these parts, the War of Northern Aggression) with his characteristic open mind. 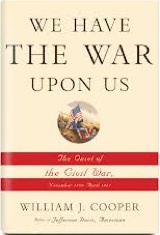 WE HAVE THE WAR UPON US: THE ONSET OF THE CIVIL WAR: NOVEMBER 1860-APRIL 1861. By William J. Cooper. Knopf. 272 pages. $30. A few years back, during cookouts on my back deck, two friends got into long debates over the cause of the Civil War. Tom, born in Syracuse but raised in Raleigh, argued that slavery was not the cause of the war. Dave, born in Arkansas but raised in California, argued that Tom and his Confederate, right-wing buddies were in denial. Yes, the war was about slavery. Had I invited William J. Cooper of Louisiana State University, the conversation most certainly would have been less emotional and more historical, but most likely the history professor and Jefferson Davis biographer would have leaned more toward Tom’s arguments than Dave’s. At least that is my inference from his newly released We Have The War Upon Us: The Onset of the Civil War, November 1860 – April 1861. Cooper focuses on partisan politics, an uncompromising Abraham Lincoln who is ignorant of Southerners and their sympathies, and the unsuccessful four-month-long struggle by William Seward and border state conservatives – from Election Day in 1860 to the fall of Fort Sumter – to forge a compromise and avoid war. Cooper doesn’t specifically say, “This was Abe Lincoln’s fault,” but he comes damned close. As some of us remember from high school American History, Lincoln was elected in 1860 with only 37 percent of the vote, all of his electoral votes coming from Northern states. Southerners were alarmed because they feared for their “liberty,” which meant, of course, their liberty to hold other humans as slaves. They also feared Northern interests that Cooper says were anti-South, considering it the Slave Power. Lincoln’s sentiments against slavery were well known, but he was not proposing to rid the South of its slaves. To the contrary, he understood the Constitution to deny the federal government that authority. He and the so-called “radical Republicans” wanted to stop the expansion of slavery into territories that would become states some day. Cooper doesn’t make a strong presentation of the other side of the attempted divorce, giving us little negative about the folks who wanted to quit the Union because they lost an election. The South had its firebrands, of course, he says, but there were also many others, like Jefferson Davis, who wanted to remain in the Union. And there were Republicans in the North who wanted to keep them in. All that was needed was a compromise that allowed slavery to expand into the territories. The job of forging that compromise fell to Sen. William Seward of New York, later to be Lincoln’s secretary of state. Cooper’s book is mostly an account of those efforts at compromise and Lincoln’s refusal to do so. And here’s my first gripe with Cooper. Although he never does explicitly blame the Civil War on Lincoln or justify secession, that sentiment sure can be inferred. In interpreting the historical record, historians stay in the context of the times. Lord knows that Professor Cooper knows more about this era than I ever will, but I don’t see how such a compromise could have been feasible even in 1860-61, be it politically, economically or historically. Politically, Lincoln and the Republicans had just won the election, not lost it. Why would they compromise away that victory and allow the influence of the slave states to grow even more powerful than it had been during the first 80-plus years of the republic? And, how could they bargain away the very principle upon which they had won the election, an end to slavery’s expansion? Their supporters would have revolted. On the other hand, what compromise would the South have made after losing the election? None, just saying they wouldn’t leave. Such a “compromise” – I would call it a surrender – by Lincoln would have rendered future elections meaningless because the losers could always threaten to leave the Union if they didn’t get what they wanted. Economically, such a compromise would have made no sense, either. The non-slave economy of the U.S. was growing faster than that of the slave states. The U.S. was on the verge of becoming a world economic power, but a compromise that allowed the expansion of slavery would have been seen in those days as a drag on the broader economy. Finally, Lincoln understood that the tide of history was against slavery in civilized nations. The British had already banned slavery, and other nations were headed that way. Lincoln was not going to get on the wrong side of that movement. Maybe if I’d invited Cooper to the cookouts, he could have explained to me how such a compromise would have worked. He’s a history professor; I’m just a retired reporter. But it is as a reporter and writer that I issue my next gripe with Cooper’s book. Given all of the drama of such a tense time in American history, one would expect a gripping read from Cooper. He doesn’t provide it. He’s an academic historian and writes with all the dullness that has turned generations of Americans away from the discipline. Furthermore, he and his editors did nothing in the editing of the book to help the reader. The chapters are interminably long with no subheads or copy breaks to denote a change of topic. He moves through the material chronologically, for the most part, providing little flavor to the topic or the participants. Despite my criticisms, I’m happy I read the book. I learned much, and it served as a good primer to the movie Lincoln. And, if he were inclined to attend, I’d invite Cooper to my next cookout. This entry was posted in American History, History and tagged American History, Civil War, Lincoln, William J. Cooper. Bookmark the permalink. 3 Responses to The Civil War – did it have to happen? Great review. Funny how much re-writing of history is going on these days. Can you imagine the Civil War happening had been no slaves in any of the states? Slavery was a necessary but perhaps not sufficient cause. And very nice review by the way.